Sometimes I go through periods where I devour books endlessly. And then there are the dry spells where I'm busy with other stuff or there's just nothing I'm into. Then, there are the books I started reading and are now languishing on my shelf, waiting to be finished. I don't like to give up on books, but here are the ones that can't seem to hold my attention despite my best efforts. A Prayer for Owen Meany by John Irving (I'm like 3/4 of the way through, last time I picked it up was 2012. I owe it to a friend who is a massive John Irving fan to finish it, on his recommendation). What are your "I-keep-going-back-to-this-and-then-not-finishing-it" books? I've started Ulysses a few times over the past 17 years. I'm no longer optimistic, and removed the bookmark last time I rearranged my bookshelves. I've actually read Ulysses. Jesus, what a broth of a book! 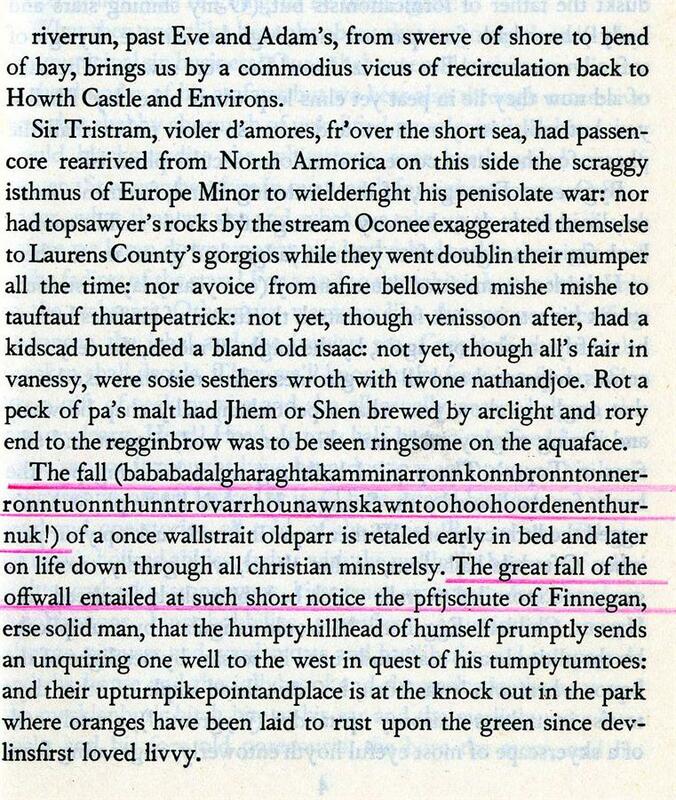 Finnegans Wake is another matter. Just looking at the title on the front cover scares the sh*t out of me. It probably doesn't help that mine's a cheapo copy and the paper stinks. Yes, Mike's book. Read up til the end of the early 90s lawsuit then stopped. Just wasn't very enjoyable. Will get to finishing it eventually. Have actually not finished a couple of nonfiction books that I loved - for the crazy reason that they were so good I didn't want them to end! Another book I tried and couldn't finish was Faulkner's The Sound and the Fury. It's supposed to be a classic and I'll try it again but couldn't get into the style of writing that just kept going on and on but even though it got interesting at times I only had so much time to read and how was I ever going to be able to stop since there were no paragraphs or periods so since there didn't seem to be a stopping point I had to give up etc etc etc. Wow John K you actually read Ulysses?! Finnegan's Wake would be way beyond my old brain's abilities. I specifically recall two attempts at Ulysses The first time, I was about 22, fresh out of college, and proud to be reading my copy on the bus to and from work. 'See this, everyone? Ulysses! Quite a massive tome, here. I assume you're all appropriately impressed with me. Yep, I'm the smart guy.' About 350 pages in, I had to admit to myself I had literally no idea what was going on. I put it away. About five years later, I started it again, this time unwilling to "read" ahead until I understood what I'd read. I got maybe 100 pages in and admitted I didn't know what was happening anymore. Someday I should just get a study guide and read it with that. I love Joyce's other, simpler work. Conversely, Finnegans Wake got even less effort than Ulysses. I got a really cheap used copy, opened it when I got home, got scared, and put it back on the shelf. I sold it back to a used bookstore years ago, knowing I'd never get there. John K, I've been thinking about the best course of action for you, LOL. Read the book, get mad at Mike, be mad at Mike at the concert, but then maybe the concert eases the anger. Or go to the concert, enjoy the concert fully, then read the book and get mad at Mike... I don't know which is better! I specifically recall two attempts at Ulysses The first time, I was about 22, fresh out of college, and proud to be reading my copy on the bus to and from work. 'See this, everyone? Ulysses! Quite a massive tome, here. I assume you're all appropriately impressed with me. Yep, I'm the smart guy.' About 350 pages in, I had to admit to myself I had literally no idea what was going on. I put it away. Me: "Hey everyone, look how scholarly and edu-ma-cated I am with my Bachelor's degree and my big book for smart, literary types like myself!" Everyone: "Oh cool, what part are you at?" Me: "The part with a list of names I can't pronounce or recall the next time I read them". I like Tolstoy--loved Anna Karenina--and am a big fan of 19th century Russian lit in general. But W&P, just couldn't get interested. Ha, that's the deadline I've given myself too. I'll probably read it after Brian's, both of which come after the stuff I'm reading now. Read Ulysses in college, and bits of it after (with the annotated guide, it helps). Always mean to go through the whole thing again fully. John K, thumbs up for the neutrality. I also went into Mike's book with a neutral position, for the same reason. And then the book ended up being hurled across the room a few times with cries of exasperation, LOL. But if you're able to maintain a neutral position regardless, then I tip my hat to you, sir. Simple "I wasn't there" doesn't mean you can't criticize/ be terribly disappointed in what's said in book though. The other extreme "I like everything by everybody" is as bad & unrealistic as "I hate everything by everybody" ("hate" - a bit strong word but you get the drift). A bit related to this topic, I am usually bored by descriptions of nature & behaviors of people ("Sun is shining", "It's snowing in Arizona", "he made tea", "she looked at dog from the corner of the eye", "their kid brother hit his servant"). Esp. if it's ubiquitous. I like the dialogs, discussions, debates - you know, what the characters talk about. The Illiad. I made it to around book 4, I think. I'l keep you posted. In the meantime, Finnegans Wake has somehow relocated from its upright position on a shelf in the hallway and is now lying on my desk. H'mm. Wow. I remember reading the Aeneid years ago. What a story! Re: "Finnegan's Wake", as I understand it, the title in the cover is what frightened you? Does the story have elements of horror? I just googled it & it doesn't seem visually scary to me. Do I miss sth.? Looking at the title reminds me of what an intense read everyone says it is. That's the only thing that's scary about it. I wonder if John Lennon ever read Finnegan's Wake and was inspired by it? Ha, I was thinking the same thing! "Humptyhillhead of humself", and "tumptytumtoes" sound like pure Lennon to me. I totally read this in John Lennon's voice and it was the best thing ever. Someone somewhere who can do a spot-on John Lennon imitation needs to record a reading of Finnegan's Wake. Or I may just take a crack at reading it myself, in John's voice, haha. The most recent book I almost finished but didn't was Thomas Pynchon's Vineland. I'd read both V and Gravity's Rainbow twice (extraordinary books both) but Vineland didn't grab me the way its two predecessors did. I have another fat Pynchon tome waiting in the wings. I bought The Mason-Dixon Line on a whim at a book launch where they had been serving white wine but I don't hold out much hope for it. Infinite Jest, I again got through about 150 pages and decided, "I don't care at all about any of these characters."